If you have an online presence and have a website that attracts thousands of visitors every day, then you must look into the performance of the website which depends mainly on the hosting service you have chosen and VPS hosting might just be the right thing for you. Also when you expect that there might be an increase in the number of visitors on your website as you are promoting it now or if you wish to expand then its high time you choose a hosting package that would be able to handle your extra traffic and cope up with your needs. In hosting services you have several options to choose from, out of which, Shared Hosting and VPS (virtual private server) Hosting are the most popular choices. Usually, people opt for Shared Hosting as it is very cheap and is good enough for beginners. But if you foresee that the traffic on your website would increase or if you wish to have a customized plan then a VPS Hosting plan would be the most suitable for you. Dedicated server hosting is also a great solution but it comes with lots of investment and cost. So VPS Hosting becomes the most feasible and an affordable option to go in for. VPS Hosting offers you the same levels of performance as that of a dedicated server that too at a price that is very much affordable by anybody. The next generation of server sharing is a Virtual Private Server (VPS). Here, several (virtual) operating system or CPU instances run on a physical machine. At this level, resources such as computation time and memory can be allocated much more fairly and better, and the services of each client (web server, database, etc.) are either completely separate or at least separate instances of the same program. In any case, the memory, hard disk area and configuration files of the customers are completely independent of each other. This increases security and allows each customer to tune their services as if they had exclusive access to the server. Usually, as a user of a virtual server, you also get SSH access with root rights for your virtual operating system. Encapsulation – Each VPS is largely separate from all other virtual servers. An application crash in one server, therefore, has no or limited impact on all other virtual servers. Performance – Each VPS receives a predefined amount of CPU time, disk space, and memory. While all other servers are idle, a single server can still consume almost all of the computation time, but it is no longer possible for a server to bring others, for whatever reason, their fair share of CPU and memory resources. Security – Each virtual server behaves like a separate root server, so it is always separated from all other servers by the capsule. Even with maliciously misconfigured services of a server, no access to other users and their data is possible. Flexibility – Within the given virtualization technology, each user is free to optimize their own web servers, database and mail servers, without having to be considerate of other users. There is also no longer a basic compulsion for all users to use the same version of PHP or MySQL. The end of the year is near and there might still be changes on the list, but at the moment these are our top 10 VPS Hosting Companies in Malaysia. If the price is your main factor when deciding which web hosting to purchase, here are the prices from the cheapest to the most expensive web hosting. What Is Virtual VPS (Virtual Private Server)? In VPS Hosting a physical server is divided into small virtual servers. In VPS Hosting a physical server is divided into small virtual servers by creating a virtual partition between them. Now each virtually partitioned virtual server acts as an independent server and has its own operating system. These virtual servers are as good as a dedicated server as these can be customized and you also get your dedicated IP along with root access to your server. In VPS Hosting you can choose from Windows VPS and Linux VPS. Both Windows VPS and Linux VPS are equally efficient. Windows VPS runs applications that are specific to windows as operating system and it works the same way for Linux VPS. You can also host unlimited websites on your VPS and also customize it the way you want to. Further, your website will now be able to handle any amount of traffic that is coming to your site. And you can also scale up and scale down your resources on your server depending on your applications installed and the traffic expected. Also, each virtual server is as secure as a dedicated server which is not the case with a shared hosting account. You can also get rid of the cost of maintaining your server as it will be now managed by your VPS Hosting provider. What To Look For In A VPS Hosting Company? The first thing to do is look for several reputable VPS providers among the many companies offering the service. These companies mostly have their reviews posted on the internet and an online search would be a good place to start. Compare several reviews and you are bound to find several companies that are rated well. Once you have found these companies with great reviews, you need to go on and research on the particular company. All the necessary information and reviews regarding the company can be easily found on any search engine. Both positive and negative information will be revealed here. After establishing that the company is reputable you will then need to find out if they have the capacity that you require. You can identify a good VPS company by its capability to host your website and comfortably accommodate any required capacity increase. There should be sufficient bandwidth capacity, storage space, compatible systems and other requirements as may be needed. Another very important consideration when looking for a VPS company is security. Security of data and transactions must be guaranteed by the hosting providers. You and your clients will be at a risk if you decide to work with a company that does not have the capacity to provide adequate security. You will find that every moment of the day, a good VPS company is able to provide its users with high-quality technical support. This will ensure that downtime or other technical issues that arise are quickly and efficiently resolved. You may, however, want to skip companies that are not highly experienced because they tend to have frequent episodes of downtime. Patient research, consultation and careful evaluation are all very important because it is not easy to find all these qualities in one company. VPS Web hosting is a sort of bridge around dedicated web hosting and shared web hosting. It is an effective world wide web internet hosting treatment for companies which have to have a lot of world wide web server resources. With this kind of internet hosting, you get the rewards of a devoted internet hosting but is more cost-effective than traditional devoted web hosting. In general, as VPS take advantage of the technique of partitioning a physical server personal PC into an array of (digital) servers, each possessing its independent functioning method and application. Website owners who are searching for remarkable characteristics coupled with more desirable command about website administration. The safety and scalability as presented by VPS hosting are unmatched to any other type of internet hosting. This procedure is cheaper than devoted hosting and presents you a versatile and trusted opportunity with total entry to the root server. A VPS web hosting gives you the potential to create sandboxes, just one single bodily server with two virtual private servers. You can have two internet sites on the identical server but can make updates to an individual of them without the need of impacting the other in any way. A unique or home business that will want their internet hosting to be better and a whole lot more customizable than shared hosting would preferably advantage from VPS Hosting. The evolution of digital private servers has arrived of age and the bridge around the economies of shared hosting and big budget committed internet hosting is now a reality. The primary edge of virtual private servers is the jet pace with which you can access each individual unique private server. There is no sharing relating to the servers and hence your specifics and info are entirely safe. Consequently, you benefit from an amount of isolation or independence and strengthen control which is matchless at the specified price level. The online local community now is abuzz with the idea of virtualization. A person of the most one-of-a-kind positive aspects of by making use of digital private servers is the price gain. You can get almost the similar characteristics as with dedicated servers but at a significantly reduced cost. VPS internet hosting allows assured platform sources and burstable RAM thus letting you different crucial responsibilities into less complicated assignments. Virtual private servers have attracted lots of net builders and world-wide-web masters as here they can configure and install their very own program purposes. What Is The Difference Between Shared Web Hosting And VPS Hosting? If you start with a website, of course, a good hosting package is required. Hosting is actually the term used for renting a piece of storage, computing power, and disk space of a server at a web host. Above all, the hosting provider takes care of the technical side of your website. It provides you with a server where your website can be reached over the internet, backs up the server and configures it so that the page runs fast even in heavy traffic. When choosing a hosting package, you have the choice between different options. The most important are shared hosting and VPS hosting. What exactly do these two terms mean? And what is the difference between shared hosting and VPS hosting? The key difference between shared hosting and VPS hosting is the way both systems use the available hardware resources. With shared hosting, websites use resources at the same time. You may already be thinking that other users of the server may be hampered by an excessive number of requests from a webpage or application making your website to become slow or unresponsive. This also makes the biggest advantage of VPS hosting clear. Because this system has its own piece of server capacity the performance of your website will become better and more reliable. Because a VPS works completely independently, it also offers significant benefits in terms of security. for the price of RM 16.59/ month. for the price of RM 159.39/ month. Shinjiru offers 4 different VPS Hosting Packages named Basic, Standard, Pro and Premium. and costs 48 RM/ month. Exabytes offers 15 different Linux VPS Web Hosting Packages and 15 Windows VPS Web Hosting Packages. RockSoft offers different Cloud VPS Hosting Packages simply called VPS-01 to VPS-05. The biggest positive going for RockSoft is that all of their packages are unmetered. 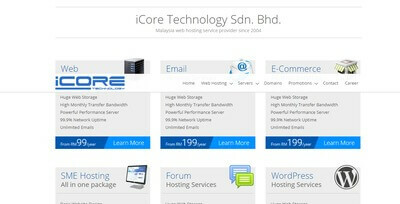 iCore Technology has 6 different VPS Web Hosting Packages, named after the amount of storage they provide. Cheapest package provides 50 GB of storage and is being called VPS50 while the most expensive package, VPS300, comes with 300 GB of storage. Their biggest advantage compared to most of their competitors is that all their packages come with unlimited bandwidth. for the price of RM 55/ month. 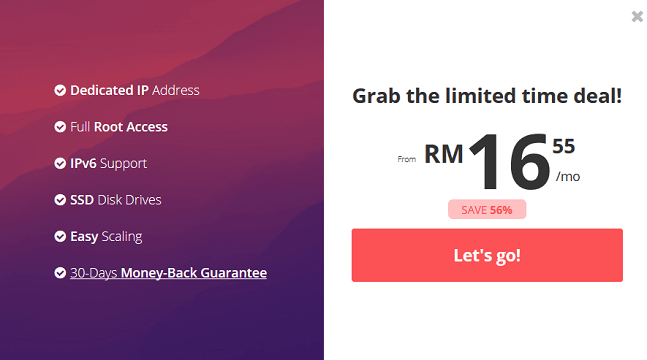 ServerFreak is one of the most popular hosting companies in Malaysia, more notable for their shared hosting. As for the VPS hosting, they offer 7 different packages, out of which, 3 are on the Linux and 4 are on the Windows platform. WebServer Malaysia is becoming more popular in last few years and it’s mostly due to the their diversity of packages for everyone’s needs. Gold Package is cheapest in both versions and costs the same, RM 139/ month. VPS Malaysia, as their name suggests, are most famous for their VPS Web Hosting packages. 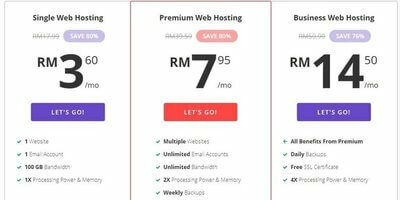 Write down in the comments if you had any experience with the above mentioned companies and if you agree with our choice for the best VPS hosting Malaysia has to offer today?